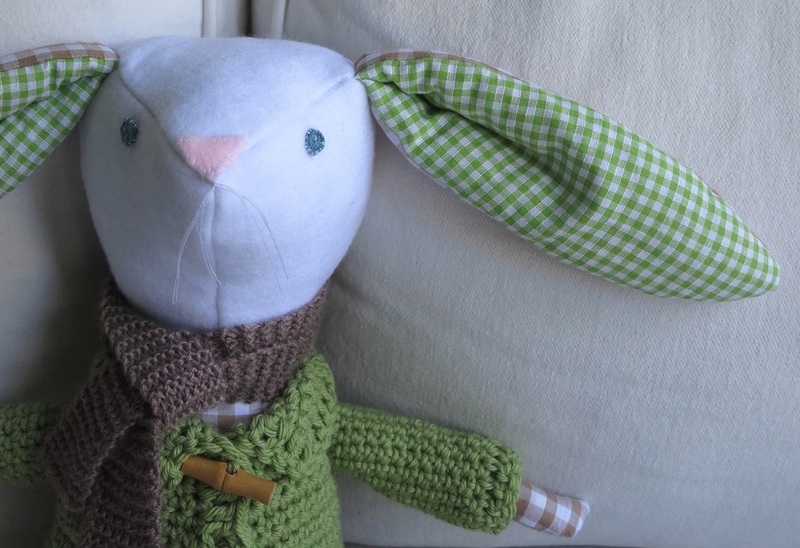 Rufus came to be for a good cause, I made him for the Softies for Mirabel toy drive. Softies for Mirabel is such a lovely creative way to bring a smile to a little kids face who could really use something to smile about. 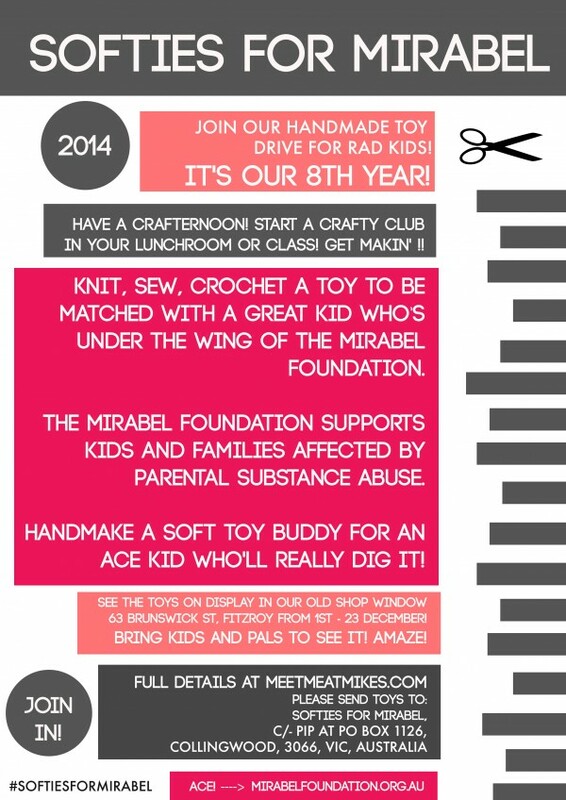 I discovered this wonderful toy drive via one of my favourite people and blogs, Pip Lincolne from Meet me at Mikes. Anyone can get involved, your toy can be whatever you want it to be! 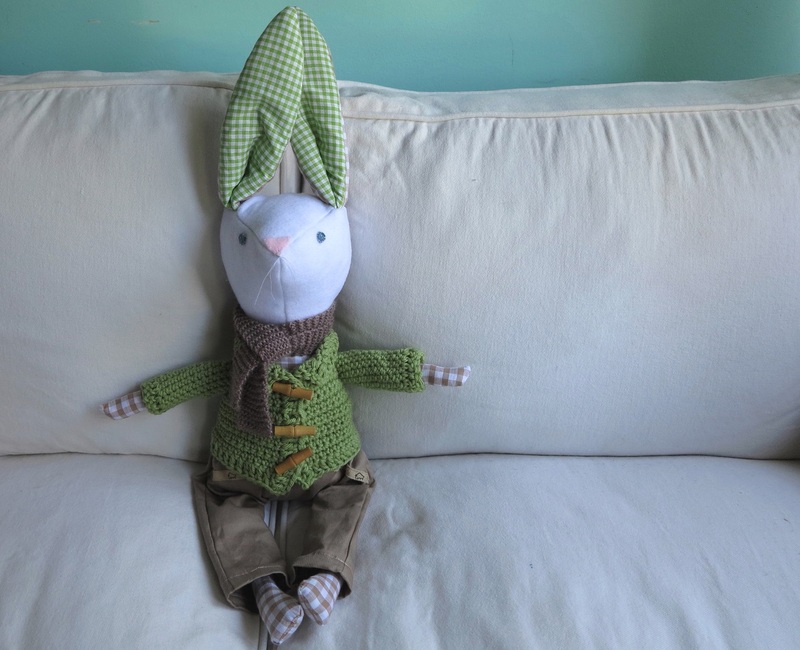 I’ve never made a stuffed toy like this before and I didn’t use a pattern. Rufus came out of my head with what whatever crafty supplies I already had (admittedly I do have a healthy craft room stash!). I was inspired by the beautiful softies on another favourite blog, Posie gets Cozy. They are totally adorable, as is the blog and the softies creator, Alicia Paulson. Rufus sports crocheted eyes out of sashiko thread, a stitched felt nose and some cotton whiskers. The trim on the fake pockets is something I’ve had for years. It was a packaging trim from a Bison purchase, and I knew it’d be perfect for something one day! Of course it goes without saying that I have a healthy stash of left over yarn, so crocheting a jacket and knitting a scarf seemed like a perfect way to use some up and make Rufus all cuddly and warm. Now Rufus did have some body shape and proportion issues. But I had a chat with him and explained that these things weren’t important really. It’s the stuff you’re made out of that counts. And he’s stuffed with love and kindness and a super big heart so that’s all that matters. Rufus Rad Rabbit was surprised to hear this, that his bumps and lumps and odd shape body didn’t matter. Now he’s as happy as can be and just can’t wait to meet his owner and start sharing some of his love and kindness. Wishing you sunny Sundays full of love and kindness. 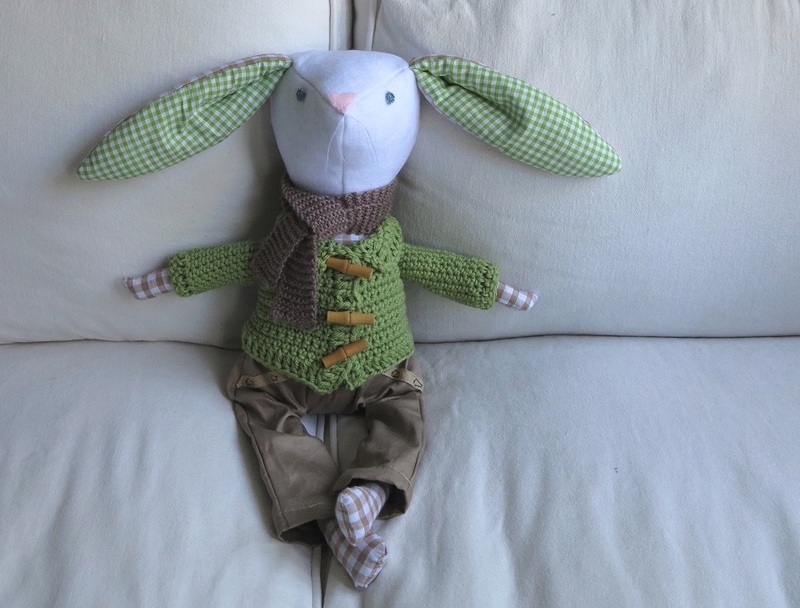 This entry was posted in craft, crochet, inspiration, knit, sew and tagged community, crochet, knit, sew, soft toy, softies, softies for mirabel. Bookmark the permalink. Wow, what a character. He will be treasured I am sure. It might be hard saying good bye but he does look like he’s ready for an adventure. Well done! I LOVE Rufus – particularly his jacket. You have done a wonderful job. Inspired me to get cracking my mine. Thank you! 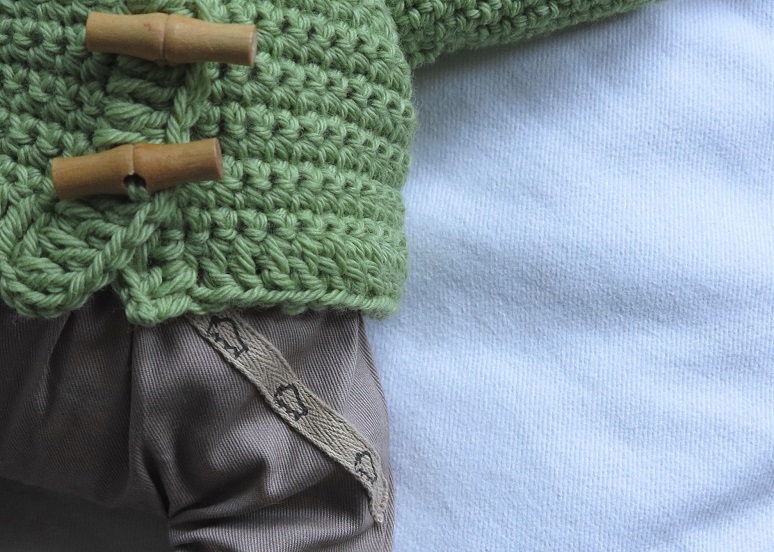 I was thrilled to find those wooden toggle buttons in my stash for the jacket. And it’s pure wool so he’ll always be toasty warm 🙂 … Oh can’t wait to see yours, glad a fab sewer like yourself can’t see his seams! Rufus is absolutely adorable and choc full of character. Love him! 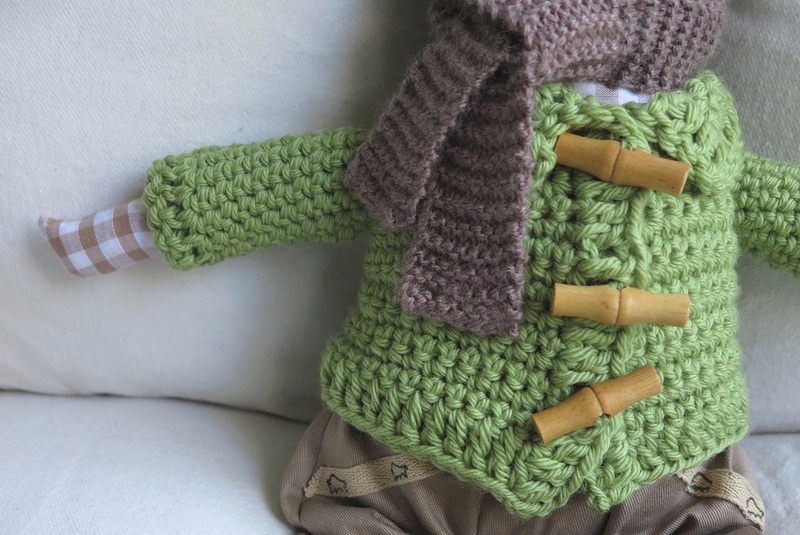 Rufus is very cute and I love his crocheted jacket. OMG, he’s the cutest little bunny ever! Love how smart he is – in his green jacket! I have nowhere enough sewing skills to make Rufus so would love to see a post with step-by-step.. Thank you so much Anya! Oh how I wish I’d taken photos of the process along the way… If I ever make another I’ll be sure to do a little step by step for you 🙂 … Thanks for popping in! You’ve done an amazing job creating Rufus. 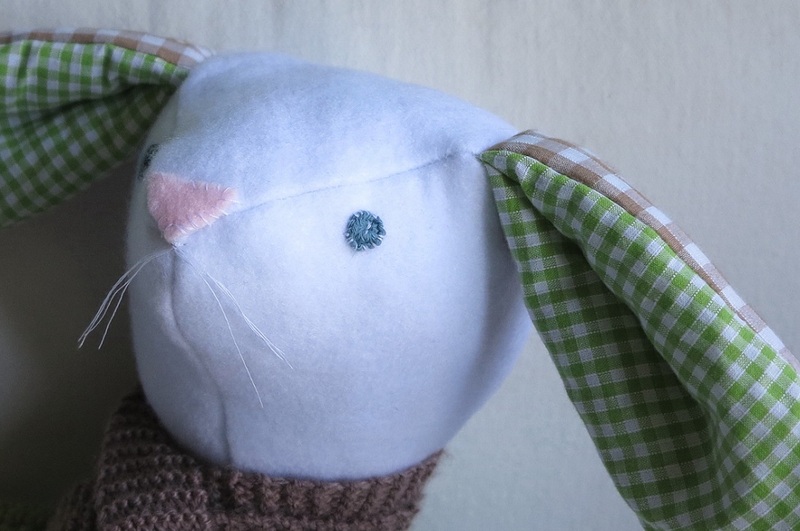 I can’t believe you made him without a pattern. I bet he will be hard to part with. Rufus is the boss! I want him to have story books.